(Waldorf, MD., Oct. 17, 2018)– The Atlantic League of Professional Baseball announced today the leaguewide schedule for the 2019 season. The ALPB will begin their 22ndyear as a league on April 25thas they return to a 140-game schedule for the upcoming season. The Southern Maryland Blue Crabs will open their 12thseason on that April 25th, hitting the road for a seven-game series against the defending champion Sugar Land Skeeters. The Blue Crabs will then return to Southern Maryland to host the Lancaster Barnstormers on May 3rdfor their Home Opener. The Blue Crabs will have 11 different homestands throughout the season, including eight of six games or more. The Atlantic League will be welcoming a new team for the 2019 season as well, with the High Point Rockers joining the Liberty Division. The Blue Crabs will first meet the new team on May 15th, as they head down to North Carolina for a three-game series. The Rockers will then make their first trip to Southern Maryland on May 27th, staying for a four-game series. The two teams will face off a total of 21 times in High Point’s inaugural season. The Blue Crabs 2019 home schedule includes a number of Holiday games as well, highlighted by the annual 4thof July home game, this year taking place against the York Revolution. Southern Maryland will also feature games on Memorial Day and Mother’s Day early in the season. The ALPB schedule is divided into two 70-game halves, with the first half ending for Southern Maryland July 7thon the road against the Long Island Ducks. The All-Star Break for the league will take place from July 8th-11th, with the York Revolution hosting the All-Star Game festivities this season. The second-half begins for the Blue Crabs on July 12thas they host their division rival Lancaster Barnstormers. The regular season will end back where it started for the team, as they wrap up with a three-game road series against the Skeeters. 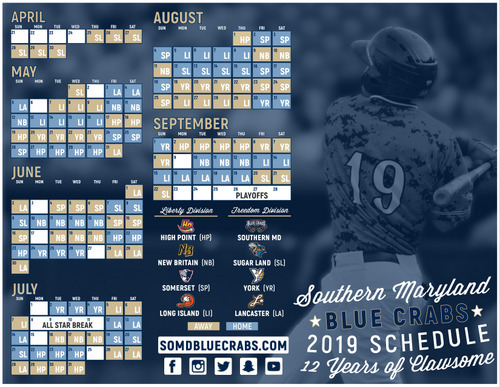 For more information on the Southern Maryland Blue Crabs, or to purchase your season-ticket packages for the 2019 season, please visit our website at somdbluecrabs.com or call us at 301-638-9788.